1. How do I request a record or transcript of a hearing? To request a reporter's record, please contact Ms. Kyriell. Please include the date of the hearing, the cause number, and the style of the case. Go to the 272nd District Court Home Page. 2. How do I speak to the Judge about my case or about a case pending in the 272nd? You will need to request a hearing or make appearance at a scheduled hearing. Please refer to the Local Rules of Administration and 272nd Court procedures for instructions to set a hearing. 3. What type of video/audio equipment is available for use in the courtroom? Please contact the 272nd Court Bailiff, Ernie Montoya at (979) 361-4221. 4. Does the Court have forms for me to use in criminal, civil, family or juvenile cases? No, the court does not provide legal forms. 1. How can I get a copy of the transcript of a hearing? You must complete the Request for Transcript form that is included in our Forms left menu link, and return the completed form to the Court. Go to the 85th District Court Home Page. 2. How do I get a setting on my case? You must complete the Setting Request form that is included in our Forms left menu link, and return it to the District Clerk’s Office. Your first setting that you will receive from the court will be a Status of Attorney hearing. The Application for Court Appointed Attorney may be filled out at that time and the court will consider your application at the hearing. 4. Where can I go to get legal forms or advice? You need to contact an attorney, research the legal section of your local library, or go to helpful websites such as http://www.texaslawhelp.org. We cannot give any legal advice. 5. How do I return to the 85th District Court home page? 1. What payments are accepted? Credit card through J.P. Morgan Chase - Pay Connexion a third party vendor. Debit and credit card transactions have a convenience fee of 2.4% of the total transaction. This fee is non-refundable. 2. How can I get a warrant recalled? Pay a one-time $500 warrant recall and resume on your payment plan. You may never miss again or the warrant will go out and not be recalled again. 3. Can I setup a payment plan over the phone? No, you must come into the office in person. 4. Can payment plans be setup without dispositions or judgments? No, you must have paperwork signed by the judge’s office before coming into Brazos County Collections Department. 1. When and where are Commissioners Court meetings held? Commissioners Court meetings are at 10:00 am every Tuesday. They take place in the Commissioners Courtroom, which is in the Brazos County Administration Building. 2. How do I get the Commissioners Court to review a particular subject? If you have an item that you would like the Commissioners Court to review, there are two methods of achieving this. 1. Call the office of the County Judge at (979) 361-4102 and request that your item be placed on a court session agenda. You must call and make your request at least two weeks prior to the court session in which you wish the item to be discussed. 2. Show up at a Commissioners Court session. Near the end of the session the County Judge will ask the public if there are any items that they wish to introduce. The public may speak at that time. The Commissioners Court cannot act upon what is being introduced. 1. What does CSCD Actually Do? We provide support services to the courts by attending court proceedings and preparing paperwork for offenders placed under supervision, as well as preparing pre-sentence reports, or social histories, on most felony offenders who go through the court system, and most legal documents for the modification and revocation of probationers. We testify in court, assist victims with questions and in collecting restitution, and assist the community by collecting fines, court costs, appointed attorney's fees, Crime Stoppers' fees, and similar assessments. The problem areas that led to an offender's criminal behavior are assessed by our officers, and a plan is put into place to address those problem areas, while holding the offender accountable for behavior, in an effort to turn offenders into pro-social citizens. Finally, we quickly report to the courts when offenders are not complying with their conditions so that the judges can take appropriate action to remove these offenders from the community. Substance abuse counseling services, domestic violence counseling, psychological assessments, and employment services are provided on-site, while psychological and psychiatric services are made available through local service providers. We regularly drug test offenders, offer electronic monitoring, a physician-supervised medical regimen for reducing alcohol consumption, and conduct regular field visits to monitor offenders in the community. We also rely heavily on local agencies, such as the Brazos Valley Council on Alcohol and Substance Abuse, Twin City Mission, Project Unity, Brazos Food Bank, Texas A&M University, and the school districts for basic needs and services for our offenders. 2. Who Does CSCD Supervise? The numbers and percentages listed here are current as of August 2007, the end of our last Fiscal Year. At that time, 4,110 offenders were under supervision through the Brazos County Community Supervision and Corrections Department. Many of these offenders have multiple cases, which are not included in this number - this is the actual number of offenders under probation supervision. Of these offenders, 2,256 are direct supervision cases, which means these offenders live and/or work in Brazos County and are supervised by officers locally. That number includes 1,137 felony offenders and 1,119 misdemeanor offenders. The remaining 1,854 offenders live and work and are supervised in other counties or states, are absconders, are in prison for other offenses, or are offenders whose supervision has expired and who are awaiting hearings to revoke their probation. Since the offenders are placed under supervision by local judges, these out-of-town cases must still be monitored by our department and the judges notified of violations of the conditions of supervision. Each month, between 150 and 200 new offenders are placed under supervision, and approximately that number terminate from supervision. Payments are to be made per the court order. Delinquencies are addressed through administrative or court hearings, and failure to pay court ordered obligations can result in the revocation of community supervision. Payments can be made in person at 202 East 27th Street, Suite 200, Bryan, Texas 77803, or by mail at BCCSCD, P.O. Box 2015, Bryan, Texas 77806-2015. No personal checks are accepted, and will be returned if an attempt is made to pay by personal check. Cash, cashier's checks, and money orders are accepted when payments are made in person. Payments made through the mail should only contain cashier's checks or money orders, as it is not a good idea to send cash through the mail. Always print your name and address clearly on the envelope and any cashier's checks or money orders sent through the mail. If you know your cause number, print that on the instrument, as well. If making a payment for someone else, clearly print their name on the cashier's check or money order, and put a note inside the envelope, explaining that you are making the payment for someone else, and where the receipt needs to be sent. When payments are made by mail, the receipt will be available at the next office visit, or will be mailed if you live out of town. A temporary receipt will be given for payments made at the reception window after the bookkeeping office has closed. Keep that temporary receipt until the permanent receipt is given to you, and compare the amounts to ensure that the payment was posted correctly. Always obtain a receipt, check all receipts to ensure that the payment was correctly posted to you, and keep all permanent receipts until your case has expired and you are sure that all monies paid have been credited to your account. Any discrepancies should be brought to the attention of a bookkeeper and/or your officer immediately. If you believe an error has occurred and you are not satisfied that your officer and the bookkeeping office have resolved the problem, call the department and ask to make an appointment with the Fiscal Officer, or speak with the Fiscal Officer by phone. Be prepared to show all receipts to the Fiscal Officer, or mail copies of all receipts and explain the discrepancy so the issue can be researched fully. Making payments is an important part of community supervision, and must be done regularly. Questions about making payments should be addressed to a bookkeeper or the community supervision officer, but problems in making the payments should always be addressed with the supervision officer. 1. Does Precinct 2 do civil standby’s? No, Precinct 2 does not participate civil standby’s. Go to the Constable Precinct 2 Home Page. 2. Can the constable office enforce civil divorce decrees or child custody orders? The constable office is unable to enforce divorce decrees or child custody orders. 1. Where do I go to early vote or to vote on election day? 2. Who do I contact to get information on voter registration? Call the Brazos County Tax Office, Voter Registration Department, at (979) 361-4471. Go to the County Clerk Home Page. 3. How do I probate a will? The Brazos County Clerk’s Office is not allowed to give legal advice, you will need to contact an attorney or you may visit Texas Law Help for assistance. 4. How do I appeal a case? 5. Can I do a record search by phone? No, all record searches must be submitted in writing and the proper search fee must accompany request. However, property records may be search online at Texas Land Records..
1. How do I get a transcript of court proceedings? You will need to contact Laura Bailey at (979) 361-4250 to request a copy of a transcript. Please provide your name and phone number along with the style of the case, the cause number, the date and time of the court proceeding and what portion of the proceedings you would like transcribed. Ms. Bailey will contact you with the price of the transcript after she receives the above information. 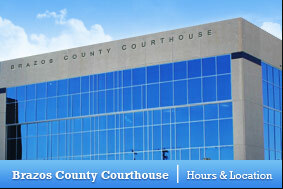 Go to the County Court at Law #1 Home Page. 1. Where do I file for divorce or name change? With the District Clerk’s office located on the first floor within the courthouse. 2. How do I reset my case? All reset requests must be made in writing. In certain situations a Motion for Continuance may be required to remove a case from the docket and add it elsewhere. Our office needs information related to the reason for the request and in civil cases, some optional dates that you may be available for court. 1. How is an arrest made? 2. What happens to the accused? 3. How does my case get to your office for prosecution? 4. What does a Grand Jury Do? 5. What is a Pre-Trial Hearing? 6. What happens when the case goes to trial? 7. What happens during judgment, sentencing and appeal? 8. Why might a case not go to trial? •	If the prosecutor determines that there is not sufficient evidence to obtain a conviction, he may file a motion asking to dismiss the case; this is only done after a thorough investigation and normally after police have exhausted all avenues for obtaining additional evidence. The judge will grant the motion to dismiss if he is satisfied that the case cannot be proven at trial. •	A defendant may choose to plead guilty and may not want a trial. In this case, the judge would impose a sentence immediately or at a separate hearing. •	The prosecution and the defense may decide to negotiate a plea in the case. The negotiated plea is basically an agreement between the attorney representing the State and the defendant and his attorney. It acknowledges that the State will recommend a specific punishment if the defendant will enter a guilty plea. There are advantages to both the State and the defendant in reaching such an agreement. The agreement is not binding upon the judge, who may impose any punishment within the range authorized by law. •	Our goal in negotiating a plea is to achieve a sentence similar to what a jury would likely do under the circumstances. If you have any questions regarding this process, contact the prosecutor handling your case. 9. Should I talk to an Investigator or Defense Attorney about the case? 10. How are witnesses called for trial? 11. What do I do at the Trial? •	The truth of your testimony, the manner in which you give it and your appearance on the stand will all be considered by the jury or judge deciding the case. •	Your manner of dress may have an impact on jurors who hear your testimony. Therefore, dress neatly and conservatively when appearing in court. 12. Can I be compensated for being a witness? 13. When can I have my property back? 1. Can you tell me if I have an open warrant? No, the district clerk’s office cannot give out that information. 2. If I am planning on not hiring an attorney will the District Clerk’s Office provide me with the correct forms? Hiring an attorney can insure your rights and provide you with the best legal services available. The district clerk’s office has no forms / documents. You can go to Texas Law Help and print out any forms you need and file it with the district clerk’s office. 3. How can I locate or get a copy of a disposition or any other paperwork on any civil or criminal case? You can locate the disposition or any other paperwork filed on the Justice website or submit a request with the District Clerk’s Office via email, fax, or in person. You do have to put your request in writing. We charge $0.50 per page for regular copies and $1 per page for certified copies. 4. What types of agencies should I include in my petition for expunction? We are not allowed to give out any legal advice, however you can log onto Texas Law Help and search for expunction. 5. I am getting divorced and the respondent lives in a different county. How will they get served? The district clerk’s office can prepare the citation for you and you can contact the other county’s constable or we can serve them by certified mail. 6. When is my court date? You can find that information on Justice website or you will receive a notice in the mail. You may also speak to your court coordinator. 1. Who Qualifies for a Court Appointed Attorney? Please refer to the Brazos County Indigent Defense Plan for a complete explanation of who qualifies for a court appointed attorney and how attorneys are selected. Go to the Felony Associate Court Home Page. 2. How do I apply for a Court Appointed Attorney? All persons incarcerated are provided the opportunity to complete an Affidavit in Support of Court Appointed Attorney prior to magistrate warnings at the Brazos County Jail. If you did not apply for an attorney at your initial appearance and you remain incarcerated, you may ask jail personnel for an application and forward the request to the Court Coordinator of the transferring Court for review. If you apply for a court appointed attorney but bond out of jail within three days of your arrest, it will be necessary for you to complete a new Affidavit in Support of Court Appointed Attorney and forward the notarized Affidavit to the Court Coordinator of the transferring Court during normal business hours for review. You may apply for a court appointed attorney at your first court appearance or any time prior to your first court appearance by completing and forwarding a notarized Affidavit to the Court Coordinator of the transferring Court during normal business hours. When completing your request for a court appointed attorney, you must answer every question on the Affidavit in Support of Court Appointed Attorney, provide copies of supporting documentation and swear to the accuracy of the information before a notary or court clerk. Failure to properly complete your request will result in denial of a court appointed attorney. 3. What are my responsibilities once I have been appointed an attorney? If you are not incarcerated, it is your responsibility to contact the attorney appointed for an initial appointment. If you are not incarcerated, it is your responsibility to maintain contact with your court appointed attorney. It is your responsibility to maintain an accurate address and other contact information with the court. Should any of your financial circumstances change after completion of your Affidavit in Support for Court Appointed Attorney, it is your responsibility to provide the updated information to the court. 4. Do I have to attend my court setting? You must attend all court settings unless you have prior approval by the court to reset your case. If you fail to appear at your court appearance, a warrant will issue for your arrest. Hospital excuses are not sufficient to excuse your court appearance unless it is a life threatening circumstance. 1. Can you check on the status of my application? Human Resources can tell you if we have received your application and if it has been sent to the proper department. Each department handles their own interview process and will contact you if they would like to set up an interview. 3. Is there a limit on the number of jobs that I can apply for? There is no limit to the number of positions you may apply for. However, if you submit a paper application you must complete a separate application for each position. 4. May I personally contact the individual in the hiring department who will conduct the interviews? We discourage applicants from contacting the hiring department until they have been selected for an interview. The Human Resource Department forwards the applications to the proper department. After reviewing, the department decides, which applicants to interview. Not all applicants will be interviewed. We do not accept resumes in lieu of a completed application. However, you may attach a resume or other required documents to your application. Resumes may be submitted as a supplement to the online application. Resumes are not accepted in lieu of applications and/or the Work History section. 6. What benefits are offered to employees? View our employee benefits package. 7. Where can I get information about current job openings with Brazos County? 1. Can my child do extra community service to help with fees? Extra community service is an option but must be approved by a judge. Go to the Juvenile Justice Center Home Page. 2. If I have a complaint, who can I talk to? Our goal is to provide quality customer service. Any Supervisor may address a complaint. If your complaint is regarding a specific officer, then please ask to speak to that officer’s immediate supervisor. If you are not satisfied with the supervisor’s response to your complaint you may ask to speak with Assistant Director Collin Coker. If Mr. Coker is not available, you may request to speak to Executive Director Linda Ricketson. 3. What form of payment will the Juvenile Department accept for payment of fees? We accept cash, money order, or cashier's check. No personal checks are accepted by the department. 4. What happens if I fail to follow the rules listed in the Deferred Prosecution Contract? A referral is forwarded to the District Attorney’s Office. The child’s Deferred Prosecution contract can be terminated. If so, a petition is filed, the child must return to court, and an Adjudication / Disposition Hearing takes place. The disposition can range from some form of Probation supervision in the community, or placement in a private, state, or local residential treatment facility. 5. What is Deferred Prosecution? A second chance. Some of the youngest, least serious offenders get a second chance to prove to the court that no further action is needed to prevent future illegal activity. Those who succeed in this six-month Deferred Prosecution program avoid the adjudication process and continued involvement with authorities. 6. What is the age group that you deal with? People between the ages of 10 and 17. 7. What is the difference between Deferred Prosecution and Court Probation? Deferred Prosecution is an informal agreement between the child and the department in which the child must meet certain requirements. If the child does meet those requirements and does not have any problems, then the child will not have to be adjudicated and placed on probation. Court Probation is when the child is adjudicated and placed on formal probation in which the child must meet certain conditions of the court. 8. What is the longest amount of time that you are able to hold a child in the Detention Center on a runaway charge? The department may only hold a runaway for 24 hours. Go to the Misdemeanor Associate Court Home Page. All persons incarcerated are provided the opportunity to complete an Affidavit in Support of Court Appointed Attorney prior to magistrate warnings at the Brazos County Jail. If you did not apply for an attorney at your initial appearance and you remain incarcerated, you may ask jail personnel for an application and forward the request to the Misdemeanor Associate Judge for review. If you apply for a court appointed attorney but bond out of jail within three days of your arrest, it will be necessary for you to complete a new Affidavit in Support of Court Appointed Attorney and forward the notarized Affidavit to the Misdemeanor Associate Judge during normal business hours for review. You may apply for a court appointed attorney at your first court appearance or any time prior to your first court appearance by completing and forwarding a notarized Affidavit to the Misdemeanor Associate Judge during normal business hours. 1. How can your Victim Impact Statement help you? Those who have submitted a Victim Impact Statement feel that completing it was beneficial to them. While they may never know the exact impact of their words, they found strength in knowing that whatever the decision was, it was made by someone who was informed about how the crime affected its victims and survivors. Victims and survivors who have completed the Victim Impact Statement felt it gave them a greater opportunity to participate in the criminal justice process. 2. Who can provide a Victim Impact Statement? Texas law allows victims of sexual assault, kidnapping, aggravated robbery, trafficking of persons, injury to a child, elderly individual or disabled individual, or victims who have suffered personal injury as a result of the criminal conduct of another to submit a Victim Impact Statement. Close relatives of deceased victims and guardians of victims also can exercise this right. After the defendant has been indicted, the Victim Assistance Coordinator (VAC) in the prosecutor’s office has the responsibility to provide a Victim Impact Statement form to victims and survivors. After you complete the Victim Impact Statement, return it to the Victim Assistance Coordinator. He or she will send it to criminal justice professionals for consideration in making decisions about the defendant. Note: The Victim Impact Statement is not a legal document; it is not an affidavit and does not need to be notarized.